So often we been using the washing machine daily or at least 4 times a week. How often do you wash your washing machine? You can view the video I have made and you see so much of dirty out of my washing machine when cleaning. 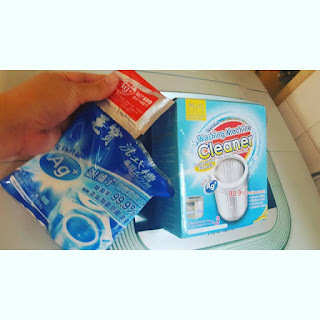 Today, I am sharing with you this product as I find it works for my washing machine. Did you know that your washing machine can be as dirty as your toilet? Studies have shown that bacteria and dirt can build-up behind the washing machine’s drum just after a month’s use. The debris from your dirty clothes are accumulated behind the drum overtime, where mold and other bacteria can grow and spread exponentially. Not forgetting microorganisms from your dirty clothes, especially underwear and socks. These dirt are usually removed through dismantling the washing machine and cleaning it manually, which are services offered by a number of external contractors or electricians, and may cost up to RM300 depending on the Year, Make & Model of your washing machine. The other issue lies within the re-assembly of the washing machine, where there are a number of people who’ve had complains about problems right after – could be problems after re-assembly, or even the lack of knowledge or experience from the electrician to do it correctly. Which is why Maobao Washing Machine Cleaner by Schelly is a great alternative to this issue. It’s also the No.1 best-selling brand in Taiwan! Each box comes with 3x cleaning powder + 3x AG+ Silver Ion. Removes up to 99.9% of bacteria, stubborn build-ups, odors, prevents mold and most importantly, keep it clean for your family. It’s also laboratory-tested (SGS Labs) to ensure no harmful chemicals are used in the making of this product. I am interested in this. I heard that the washing machine can be dirtier than the toilet bowl. This looks good! Haven't heard of this but it looks like a good product to try. Perfect since it is raining hard here in my country.